This barely understood Golden Age technology once held aloft the floating gardens of Pomona Mons. Now, its stopping bullets. The Empyrean Bellicose is a subclass neutral exotic helmet for the Titan but even without its combat capabilities it is just fun. Its exotic perk is a little different as prima facie it does not confer major bonuses to combat. The perk, Antigrav Thrusters, holds your Titan in place, in the air. for a short time when you aim down sights of your weapon. It also allows any Orbs collected while your Super is full, to recharge your melee ability. The ability for your Titan to hold themselves in place for a time can be employed in a variety of different ways, depending on how imaginative you are. 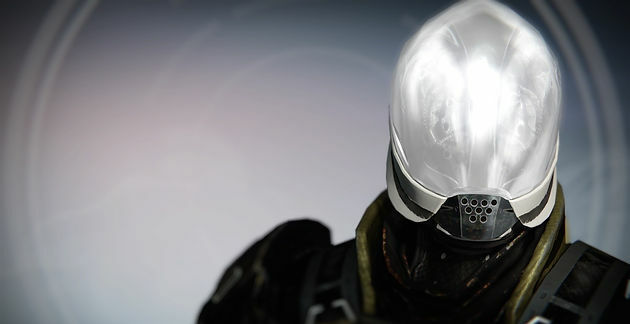 From using it at the height of your Titan Lift in order to scout the environment all the way to fighting from your increased vantage point are all ways to utilise this helmet effectively. It is for the most part a PVE exotic but some innovative and skilful Guardians have begun to utilise The Empyrean Bellicose in the Crucible with mixed results. If you are quick enough with a sniper rifle, you can ascend with Lift and aim in place with your rifle, it gives you an almost unimpeded view of the surrounding environment, find an opposing Guardian and fire, hopefully adding another kill to your tally. However this is a very tricky thing to do and you make quite a large target out of yourself so I suggest that every Titan Guardian goes out and has a bit of fun with the Bellicose because you may surprise yourself. This exotic, first of all reminds me of a helmet designed to go underwater or any place that has low oxygen content, with the streamlined look and the filtering system at the base of it. Beneath the glossy white finish that covers the Empyrean Bellicose in its entirety appears to be a series of gears which piques the curiosity. This exotic has a very simplistic look to it but it is still quite captivating to behold with its technologically advanced design that reminds me somewhat of a marine based creature. The Empyrean Bellicose can be gained from an exotic helmet engram or purchasing it from Xur if you are lucky enough for him to have it in his inventory.